The holiday season dishes up mouthwatering treats such as pecan pie, eggnog, sugar and gingerbread cookies, and stuffing. However, some of these classic dishes can be hard to navigate for those who have food allergies and dietary restrictions. What better time than during the holidays to create new, lasting traditions around the table? With some tweaking, you can take your regular holiday menu and transform it into something that everyone at your table can enjoy without the fear of having a medical disaster! Here is a comprehensive guide on allergy-friendly spreads to make cooking for the holidays a little easier for you. Taylor, founder of Food, Faith, Fitness, is an ACE certified personal trainer, Precision Nutrition certified nutrition coach. 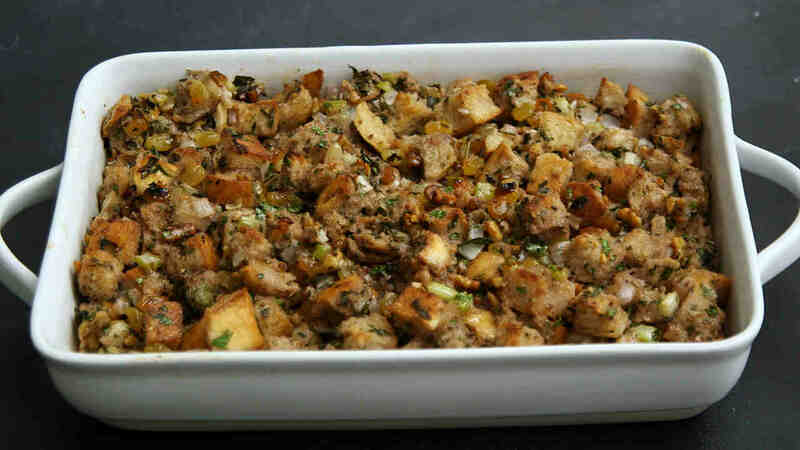 She has a delicious recipe for gluten free stuffing that will make you reminiscent of the times your grandma made stuffing. The best part about her recipe is that you can use any brand of gluten free white sandwich bread. If you are looking for a more modern twist on stuffing, try the Bon Appétit wild rice, fruit, and pecan stuffing. The wild rice pairs well with the dried fruits and nuts and doesn’t contain any bread so you can save more room for pie. Do you love brussels sprouts but not sure how to prepare them? Alyssa over at Everyday Maven has a wonderful recipe for shredded brussels sprouts with crispy shallots. The recipe calls for minimal ingredients, it’s vegetarian, and suitable for anyone who has food allergies or dietary restrictions. Olivia with Primavera Kitchen has a simple and quick, but delicious recipe for crispy roasted string beans. Follow Olivia’s instructions and tips carefully to avoid soggy green beans. If you are looking for dairy-free mashed potatoes, then look no further. Brooklyn Farm Girl uses a combination of olive oil and chicken broth to make her creamy garlic dairy free mashed potatoes. No one will know that they’re eating dairy free mashed potatoes this holiday season thanks to this recipe. If you are looking for a completely new dish to try out, try this recipe for roasted pumpkin with maple syrup and apples. Taylor from Food, Faith, and Fitness uses maple syrup to enhance the flavor of pumpkin and apple. The dish also uses ginger, cinnamon, sage, and fresh orange juice. Nothing screams Thanksgiving more than this dish.